September 5, 2018—The arrest of three more lawyers in Iran, Payam Derafshan, Farrokh Forouzan and Hoda Amid, represents the continuing escalation of Iran’s assault against its own legal profession and a flagrant violation of these individuals’ basic rights to freedom of expression and due process, the Center for Human Rights in Iran (CHRI) said in a statement today. Payam Derafshan, Farrokh Forouzan and Hoda Amid, as well as all of the other imprisoned human rights attorneys in Iran, which include Abdolfattah Soltani, Nasrin Sotoudeh, Arash Keykhosravi and Ghasem Sholeh Sa’di, should be released immediately, CHRI said. “The authorities in Iran arrested these lawyers for the same reason all the other human right defenders are imprisoned—to prevent the effective defense of political prisoners and civil liberties in Iran,” said Hadi Ghaemi, CHRI executive director. On August 31, agents of Iran’s intelligence ministry, which reports directly to President Rouhani, arrested Derafshan and Forouzan, continuing a crackdown that has accelerated since February 2018, in which other prominent human rights attorneys have been arrested, summoned to court or blocked from taking on clients. Dearshan and Fououzan were taken into custody as they arrived at the home of detained fellow attorney Arash Keykhosravi, in the city of Karaj, west of Tehran. The two prominent lawyers had gone to Keykhosravi’s home with the intention of meeting with his family, a source told the Center for Human Rights in Iran (CHRI). Meanwhile, Hoda Amin was arrested on September 1 in Tehran by Iran’s Islamic Revolutionary Guards Corp (IRGC) Intelligence Organization, days before she was scheduled to host a workshop aimed at raising awareness of women’s marriage and divorce rights. Forouzan specializes in defending the rights of children while Derafshan and Keykhosravi have both been involved in a number of politically sensitive cases, including the suspicious death of Iranian-Canadian environmentalist Kavous Seyed-Emami in February 2018. Derafshan represented Keykhosravi after his arrest, along with former lawmaker Ghasem Sholeh Sa’di, during a rally in front of Iran’s parliament building on August 18, 2018 to protest the signing of an accord between Iran and other Caspian Sea nations, which divides the body of water and its oil and gas resources. 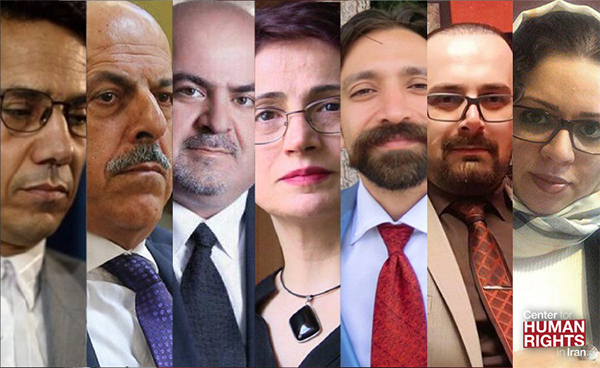 Derafshan has also been critical of the judiciary’s list of approved lawyers, from which defendants charged with national security-related crimes must choose. “The prosecutor upped the charge (against Keykhosravi) from ‘disruption of public order’ to ‘assembly and collusion against national security’ even though it’s unrelated to what they did, which was attend a peaceful public gathering that didn’t harm national security the slightest bit,” attorney Derafshan told CHRI on August 21. In response to the latest arrest of their colleagues, a group of nearly 100 Iranian lawyers signed a letter to Judiciary Chief Sadegh Larijani asking why they had been charged with national security offenses for doing their job and called for their immediate release. “If a few people have views that are in opposition to a certain law or certain state decisions, are they really acting against national security? Isn’t national security being undermined instead by arbitrary and baseless interpretations of the law? … Won’t national security be better served and protected by guaranteeing the rights of individuals to freely express their thoughts and views in a peaceful manner, even if they are against official state views?” said the August 30th letter, a copy of which was obtained by CHRI. The letter continues that “sweeping interpretations of national security” violate several articles in Iran’s Constitution, particularly Articles 9 and 37.